Disney’s newest live-action remake “Christopher Robin” has made its way into the news cycle. I mentioned the movie months ago in a line-up of similar projects here. There’s a buzz of mixed reactions about it, and while most praise the direction they’re taking it, many mention the overall creepiness. Obviously we don’t know the actual tone of the movie without watching it, but all the marketing is reminiscent of horror. The phrase “sooner or later, your past catches up with you” is across the top of the poster. The now grown up Christopher Robin(Ewan McGregor) is troubled with PTSD from World War 2 and one day his old, ratty stuffed animals show up on his doorstep to help him with his problems. The toys appear as toys to everyone else, but Christopher Robin can see them move. It’s common knowledge that Disney has plenty of money to spend, so the CG employed to make the animal’s mouths move is unsettlingly realistic. 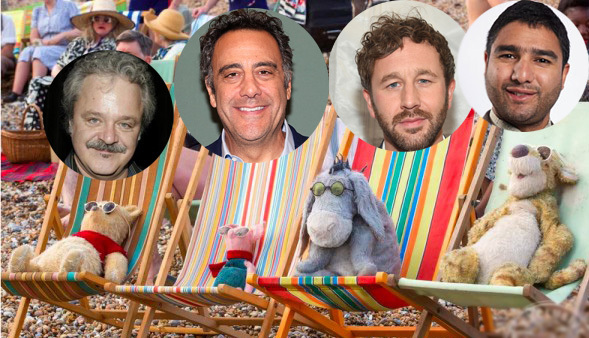 The previously mentioned trailer includes lines from the animals featured: Pooh(James Cummings), Tigger(Chris O’Dowd), Eeyore(Brad Garrett), and Piglet(Nick Mohammed). “Christopher Robin” opens on August 3rd and also stars Hayley Atwell, with Marc Foster directing.